Laurel Phipps, 97, a veteran of “The Greatest Generation” passed away, Saturday, July 28, 2018, at the Iowa River Hospice Home in Marshalltown, Iowa, surrounded by his family. Visitation will be on Wednesday, August, 1, 2018, from 5:00 to 7:00 p.m. at the Mitchell Family Funeral Home. A Mass of Christian burial will be held at 10:00 a.m. on Thursday, August 2, 2018, at St. Henry’s Catholic Church with Fr. Don Czapla officiating. Military Honors will be provided by the combined VFW/American Legion Honor Guard. Memorials may be directed to VFW Post #839. For condolences or questions please visit: www.mitchellfh.com or call 641-844-1234. Laurel Eugene Phipps was born on November 11, 1920, in Shibley’s Point, Missouri, the son of Elmer and Cora (Stewart) Phipps. He attended school in a two room country school. After moving to Marshalltown, Laurel was united in marriage to Evelyn Greenstreet. He later married Pauline Kunc. Laurel served his country honorably in the United States Navy from 1944 until 1946, during World War II. Phipps served on the U.S.S. Flint in the South Pacific as a Gunners Mate. He earned the following decorations and medals: Purple Heart, Silver Star and 20 other service medals. 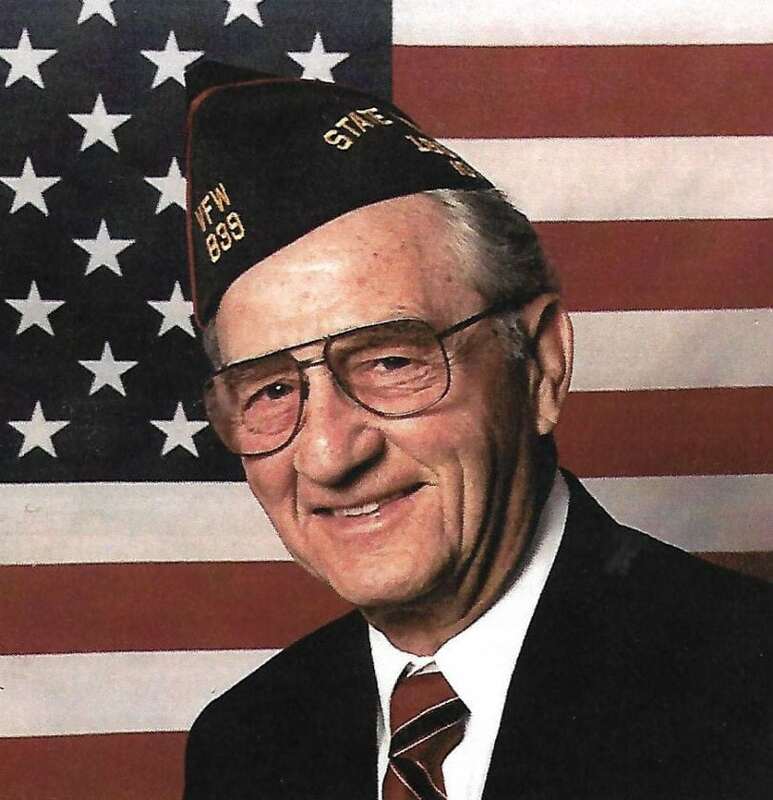 Phipps was a lifetime member of the VFW and the American Legion. Phipps has served twice as Commander to the Veterans of Foreign Wars (VFW) Harry C. Harter Post #839. He served as the 1996-1997 Iowa Department Commander to the National Security and Foreign Affairs Committee. He lobbied for Veterans Benefits. In addition, Phipps chaired the Marshall County VA Commission and served on the Iowa Commission of Veterans Affairs. Laurel was responsible for establishing the Honor Guard in Marshalltown. He also was a member of the Knights of Columbus, the Fisher 25 year Club and the UAW Retirees. He served on the city council. Laurel worked and retired from Fisher Controls as a faithful employee for 46 years. He was a member of St. Mary’s and St. Henry’s Catholic Church. Left to cherish Laurel’s memory are his children: Larry (Annette) Phipps, of Walton, Indiana, Delvin (Cheryl), of Battle Creek, Michigan, Laurie (Doug) Oatman, of Olathe, Kansas and Bill (Jan) Miller, of Lawrence, Kansas; 13, grandchildren, 16 great-grandchildren and 4 great-great-grandchildren. In death Laurel rejoins his parents, Elmer and Cora Phipps; wives: Evelyn and Pauline; siblings: Clyde, Vernon, Art, Vera, Paul and Gale.